There are other types of Queries. They are called Action Queries. They are characterized because they can affect the contents of our Tables, they can create new Tables, add or delete Records, or update Tables. These types of Queries are very delicate. If we make a mistake or if we haven't thought out how to achieve what we need carefully, we could modify a Data Base completely and without repair. Let's create a "Make Table" Query step-by-step. We will create a Query to present the data we want in our new Table. 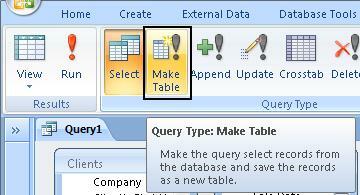 Click on the option "Make Table" under Query Type. " Type in the title of the new Table (Created Table) and click on "OK" option. 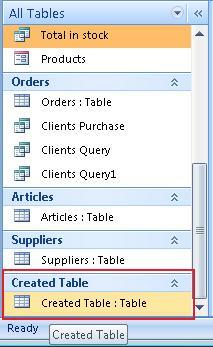 Our table won't be created until we click on the "Run" icon for our Query. As soon as we click on it, Access will show us a window to confirm our decision. And here is our created Table. At the beginning of this lesson, we mentioned that Action Queries won't only create new Tables; they also create new Records, delete them or update Tables. The function is the same as we have explained in the previous example. The only thing different will be the moment of creating the action. As you can see, there are several available options. Remember, you need to be in the Design View of Queries to be able to see these options. We used the option "Make Table" to create a new table. If we wanted to update an existing table, we would have used the "Update" option. To create Records, we use the options "Append" and to delete them "Delete".